Time & Attendance in the cloud empowers you to manage and automate the working day online wherever you are - negating the need for in house expertize or control over the technological infrastructure normally needed to support a Time & Attendance Solution. What exactly is “Cloud” and why is it gaining more and more attention from companies. 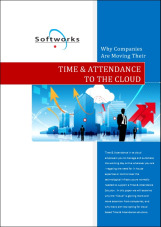 Why companies are opting for and upgrading to cloud based Time & Attendance solutions. The benefits of moving your Time & Attendance to the Cloud. Initial concerns companies have had about moving to the Cloud and how they have ensured a smooth transition. Practical advice about how to implement a move to cloud from your current Time & Attendance System.